The MeteoPV communicates with smart pyranometers, reference cells, back-of-module temperature sensors, and compact weather sensors, making it a flexible and easy-to-use POA sunstation solution. The Modbus RTU protocol over RS-485 is used to interface with the sensors, while Modbus TCP/IP protocol is used to communicate with the local SCADA system or other data collection platform. A Modbus map is built into the MeteoPV, providing aggregation of sensor readings and valuable metadata from one source. With its small footprint and DIN-rail mounting, the MeteoPV is ready for integration with existing combiner boxes or other control panels. Power-over-Ethernet compatibility is a convenient method for supplying power without needing additional power supplies. Installation and commissioning are straightforward without the headache of navigating, configuring, and addressing multiple sensor interfaces or generic gateway devices. 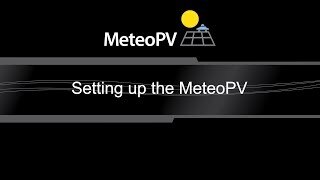 The MeteoPV hosts an intuitive onboard user interface accessed by a web browser. The browser-based interface simplifies the initial communication configuration and long-term sensor management. Simply connect, select your sensors, and start measuring.